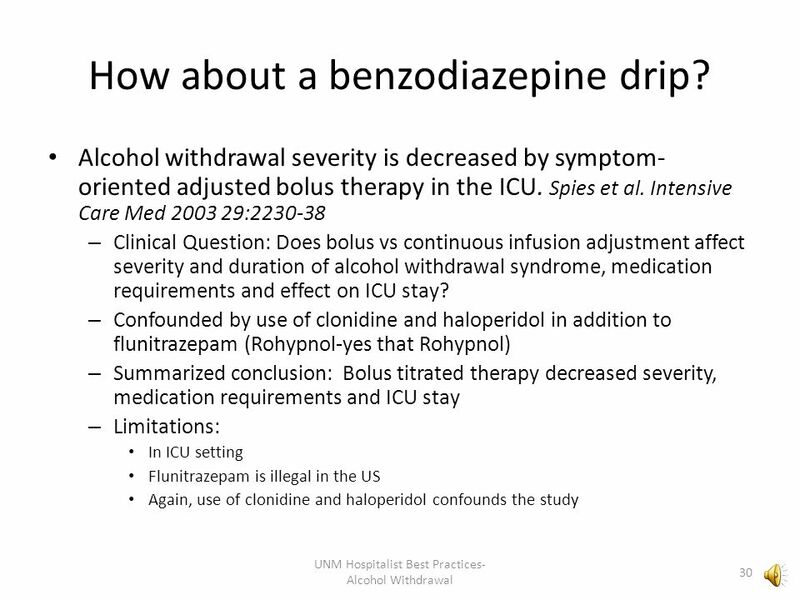 30 How about a benzodiazepine drip? 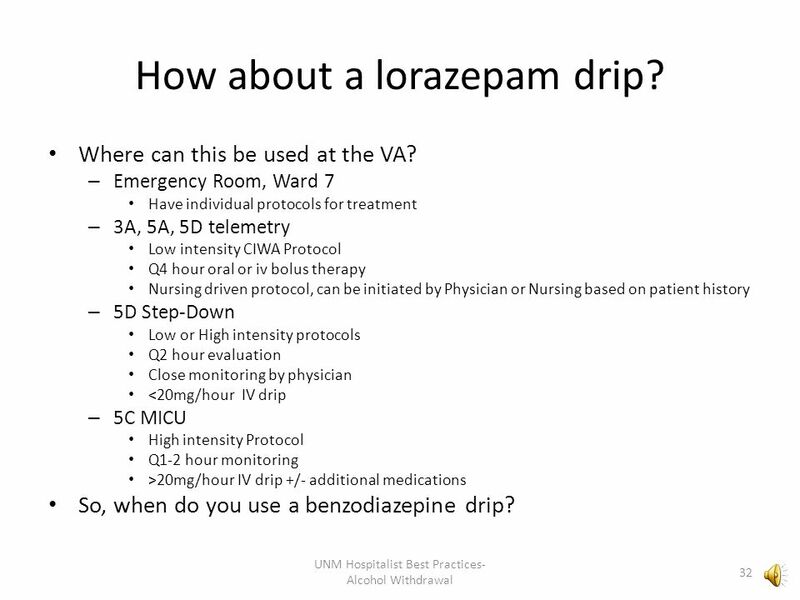 31 How about a lorazepam drip? 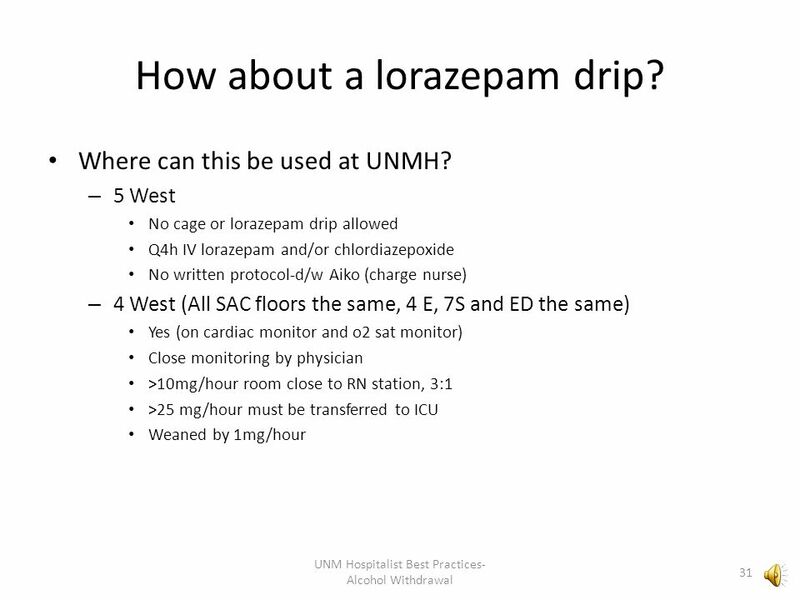 32 How about a lorazepam drip? 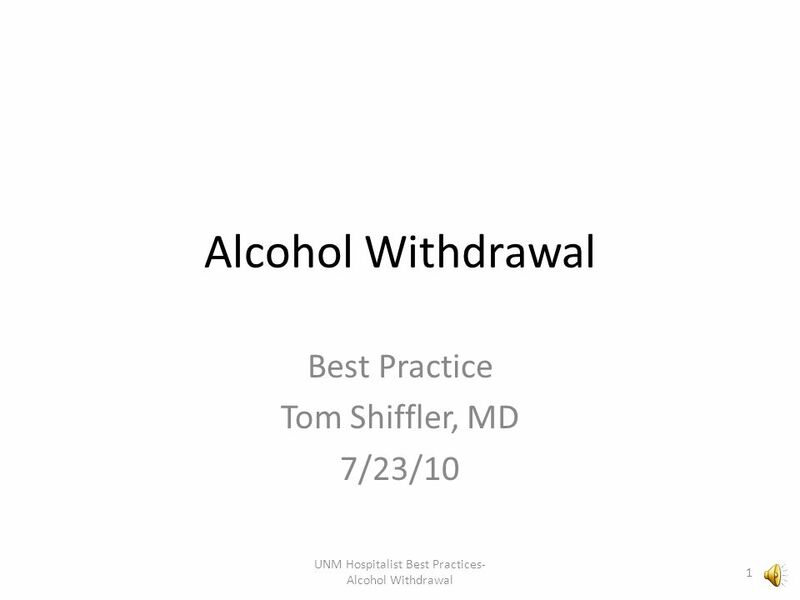 Download ppt "Best Practice Tom Shiffler, MD 7/23/10"
First Line Therapy in Acute Seizure Management William C. Dalsey, MD, MBA, FACEP Department of Emergency Medicine Robert Wood Johnson University Hospital. 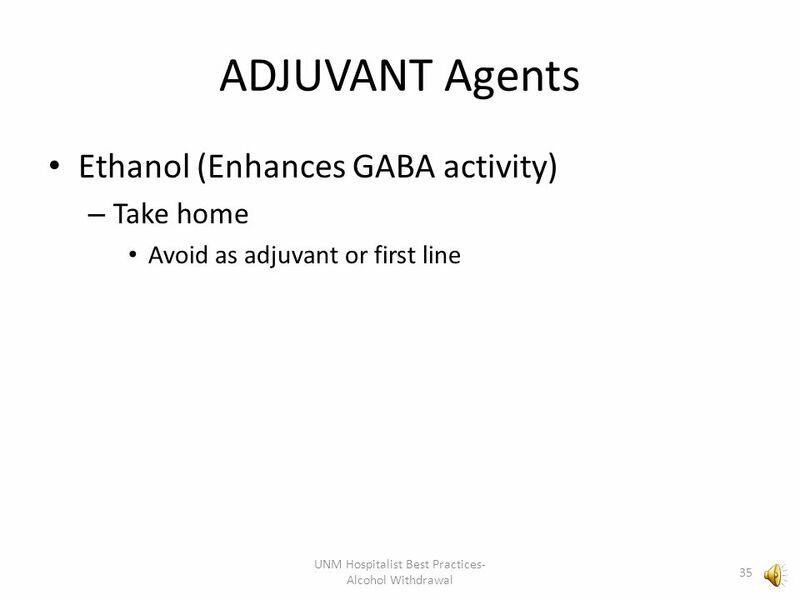 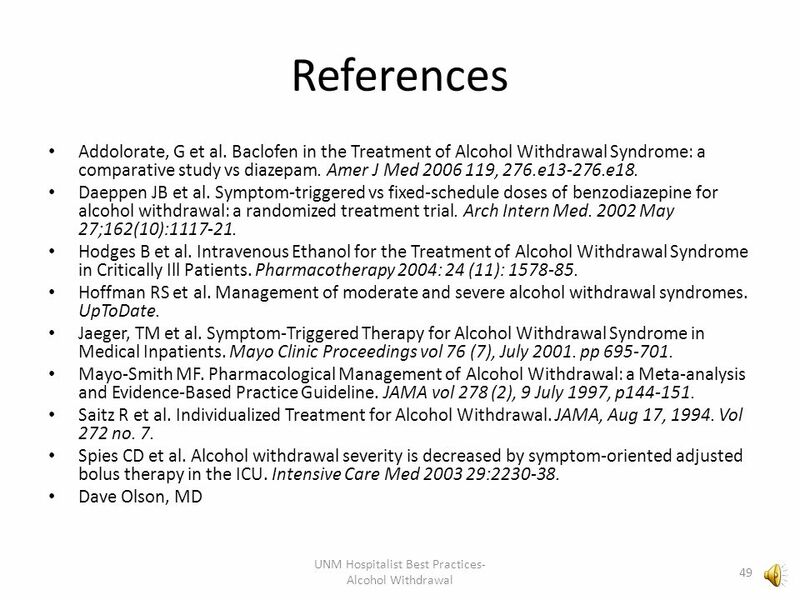 Alcohol: Research to Practice Gail D’Onofrio MD, MS Section of Emergency Medicine Yale University School of Medicine. 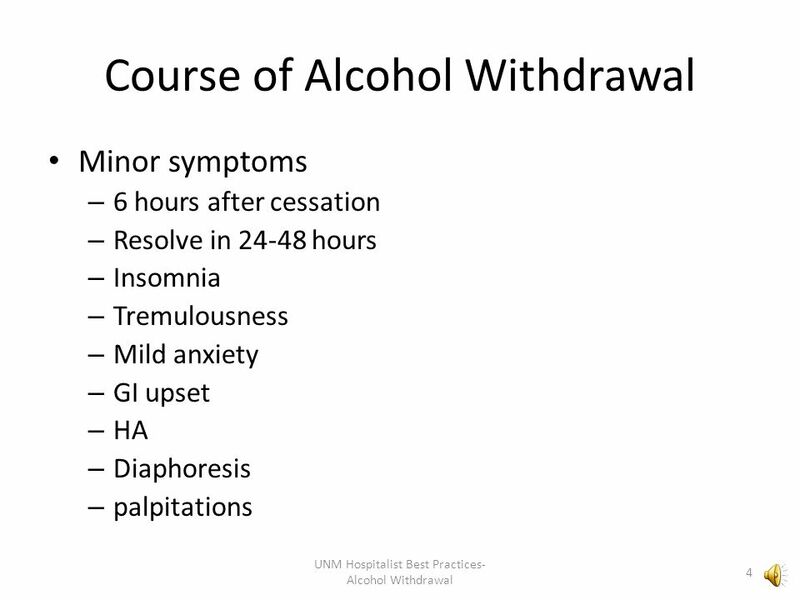 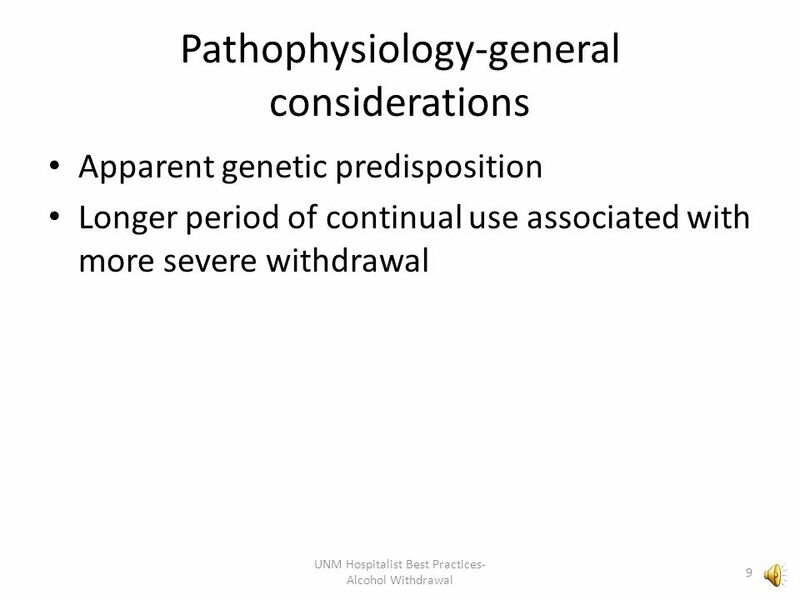 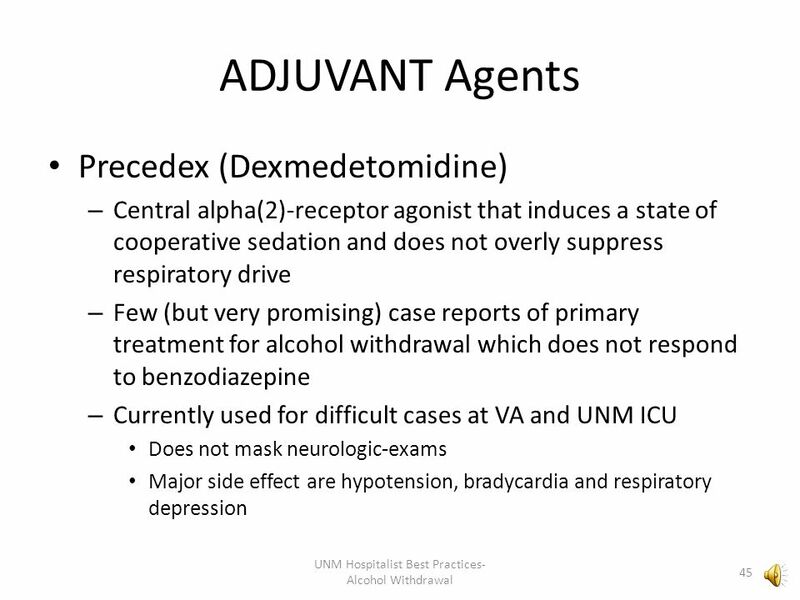 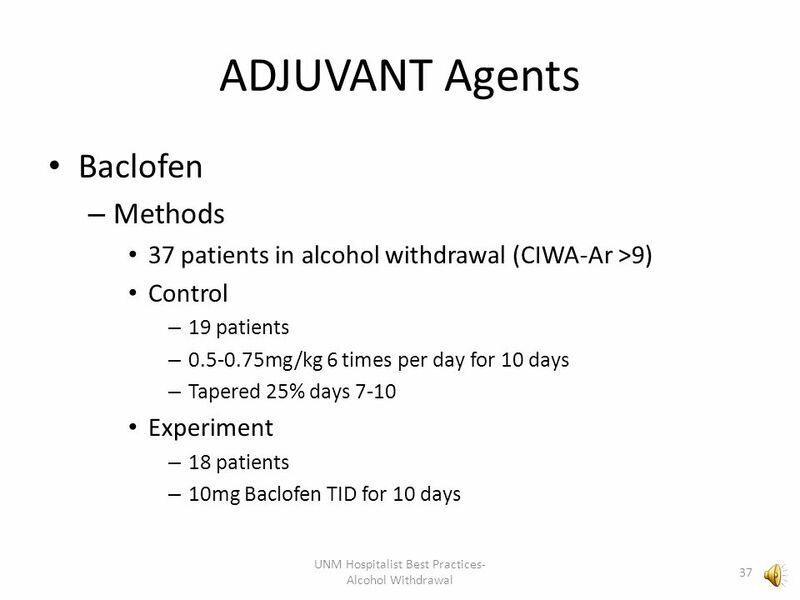 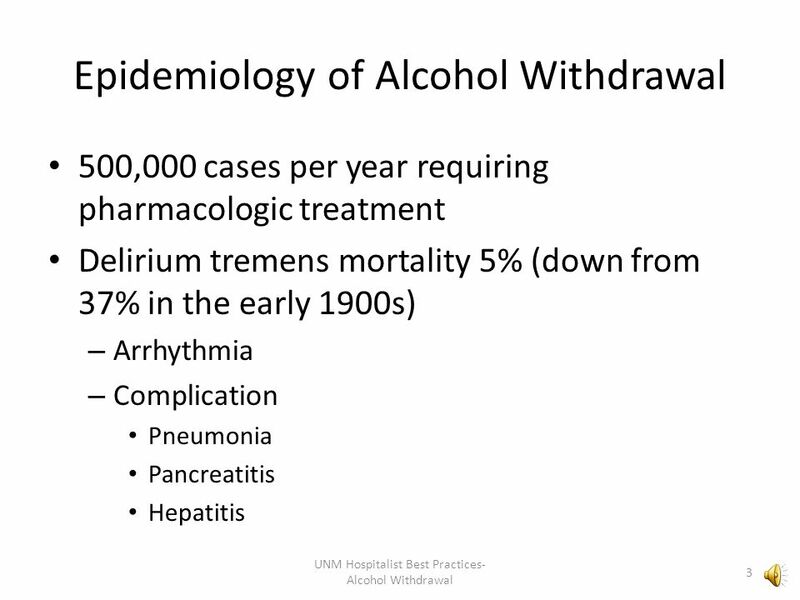 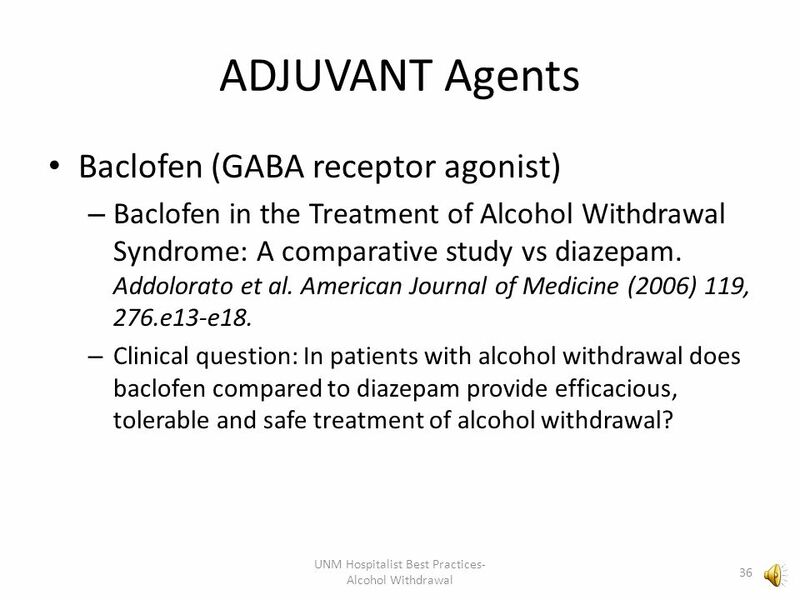 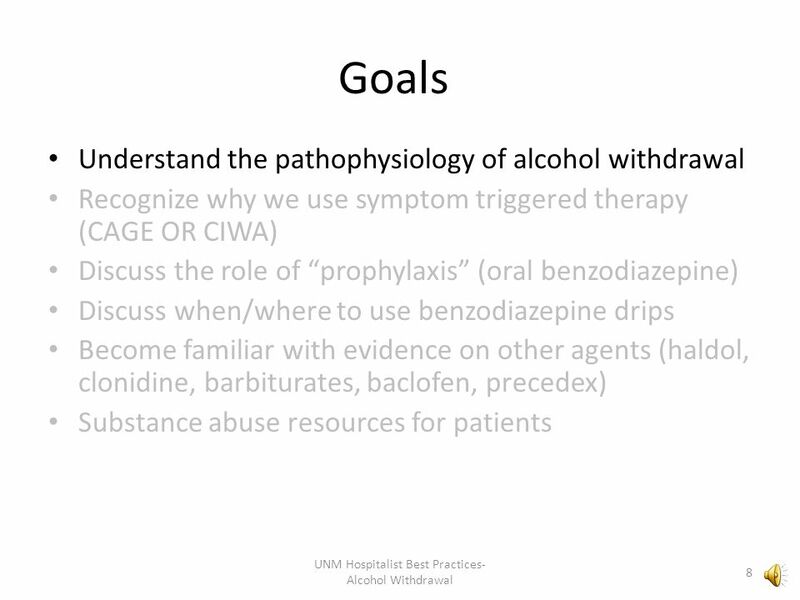 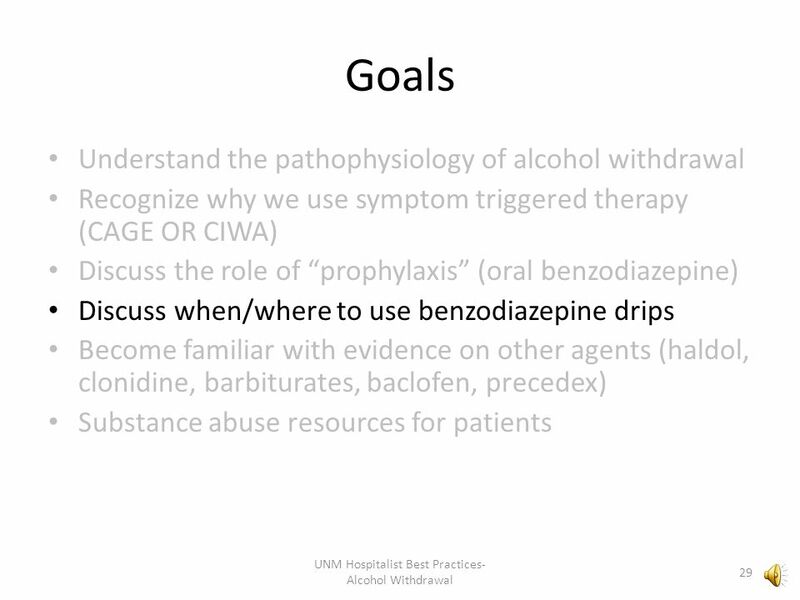 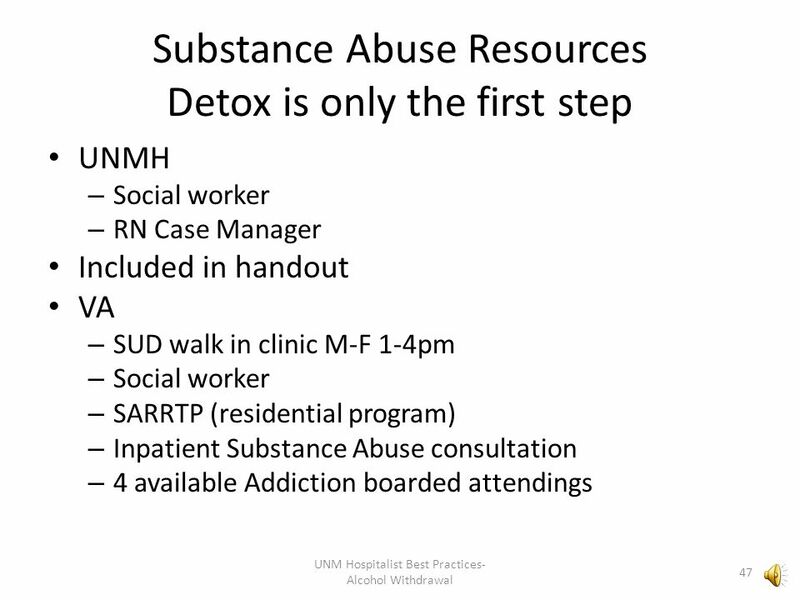 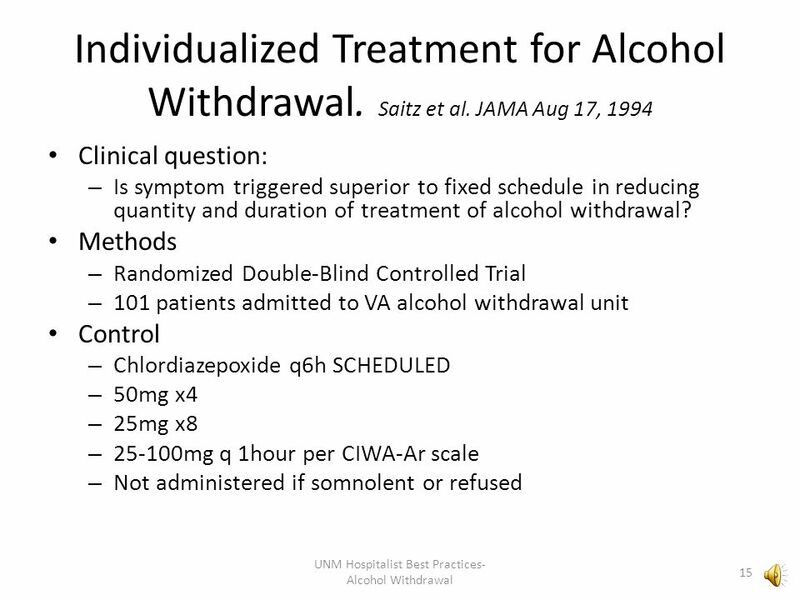 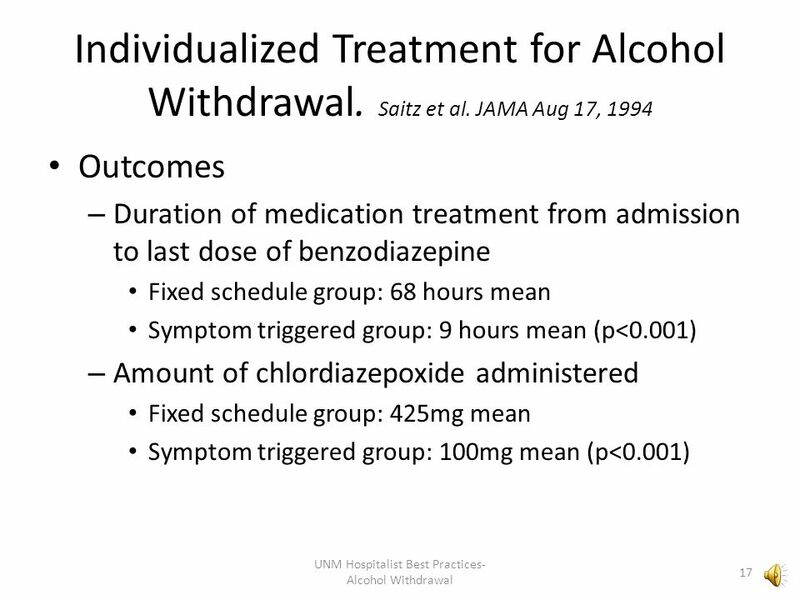 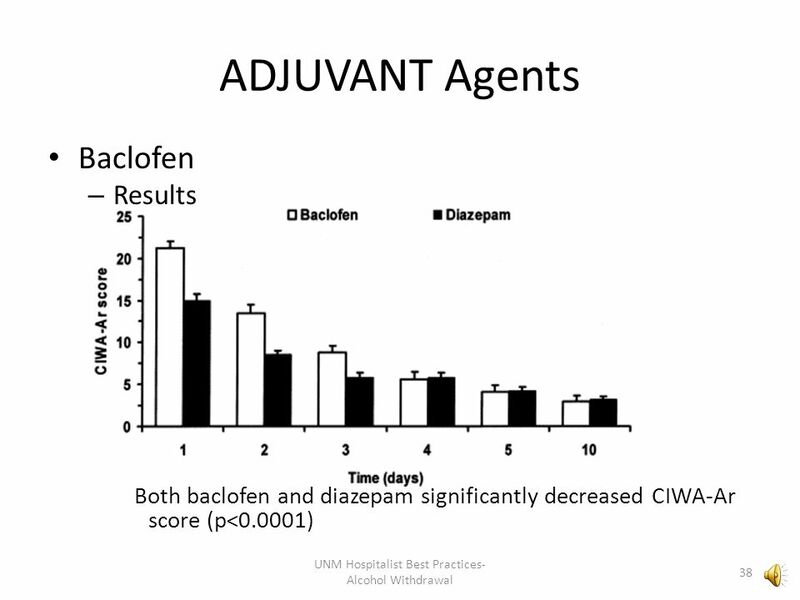 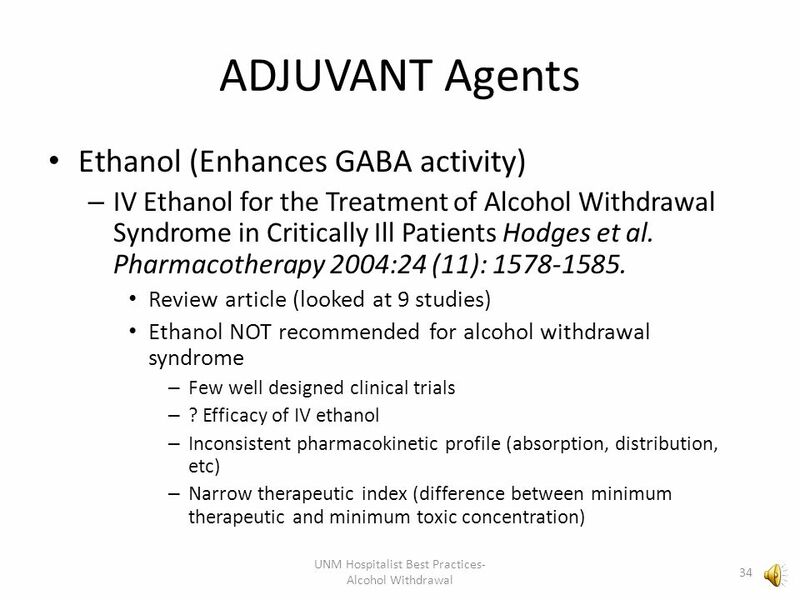 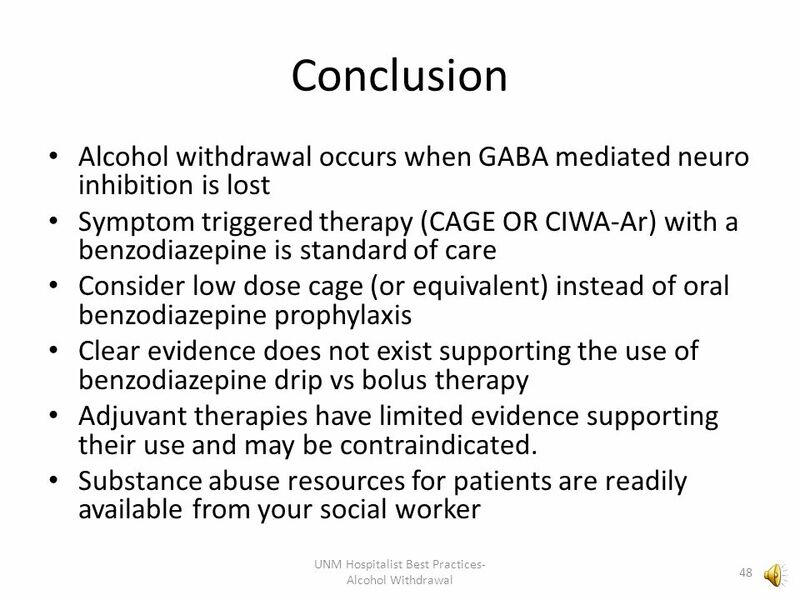 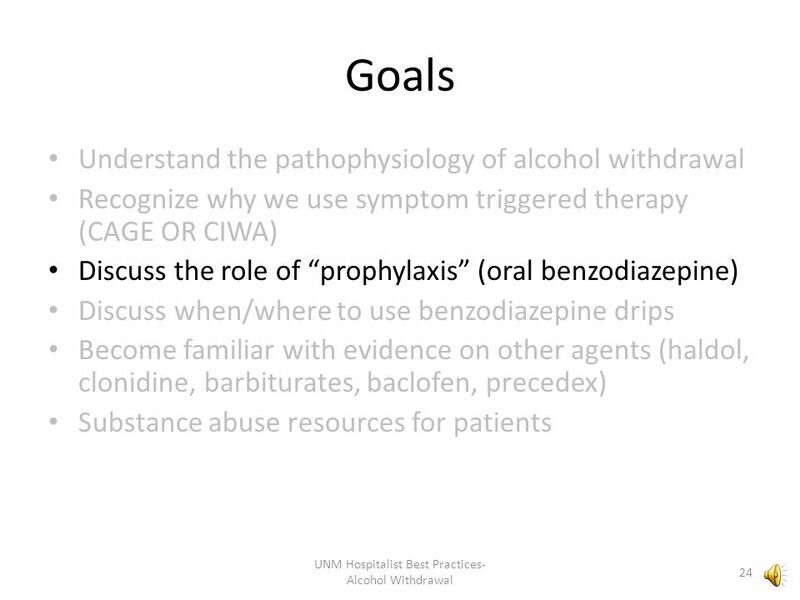 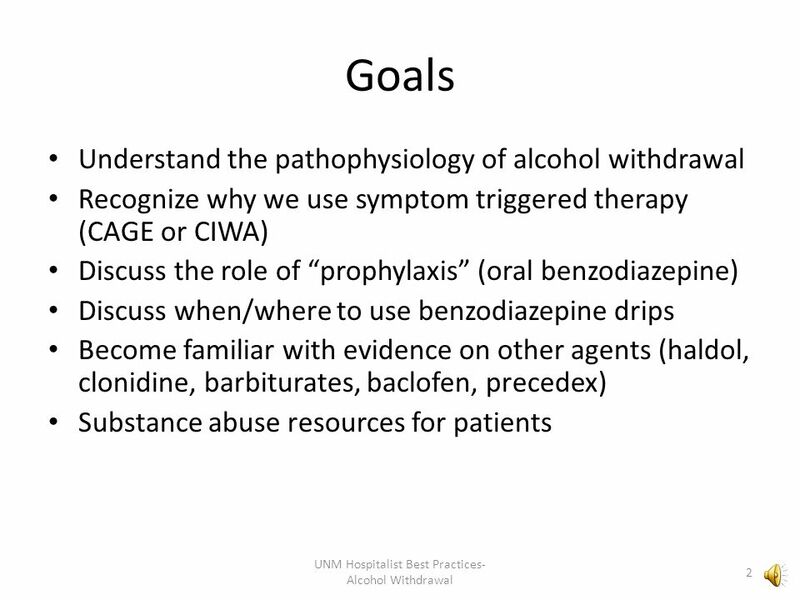 UNMH Alcohol Withdrawal Protocol Based on and adapted from alcohol withdrawal protocol at Bayfront Medical Center CriticalCareNurse Vol 30, No. 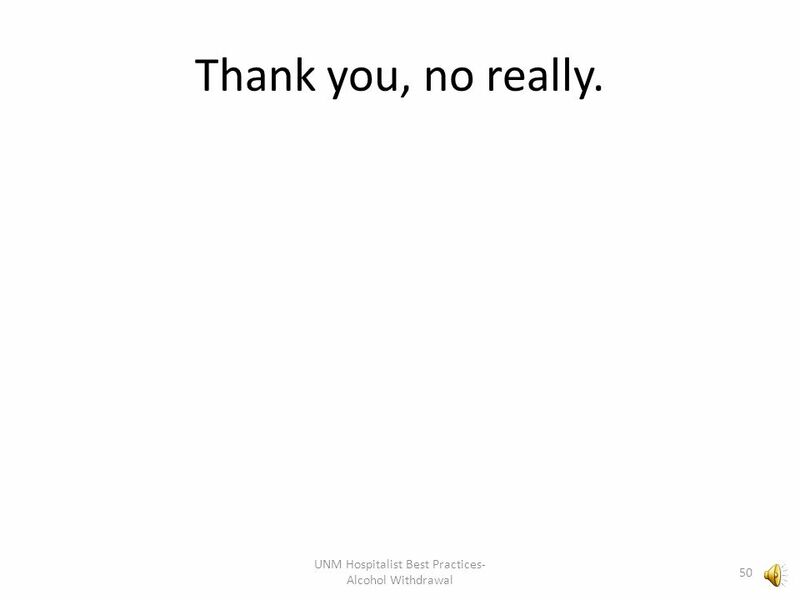 3, June. 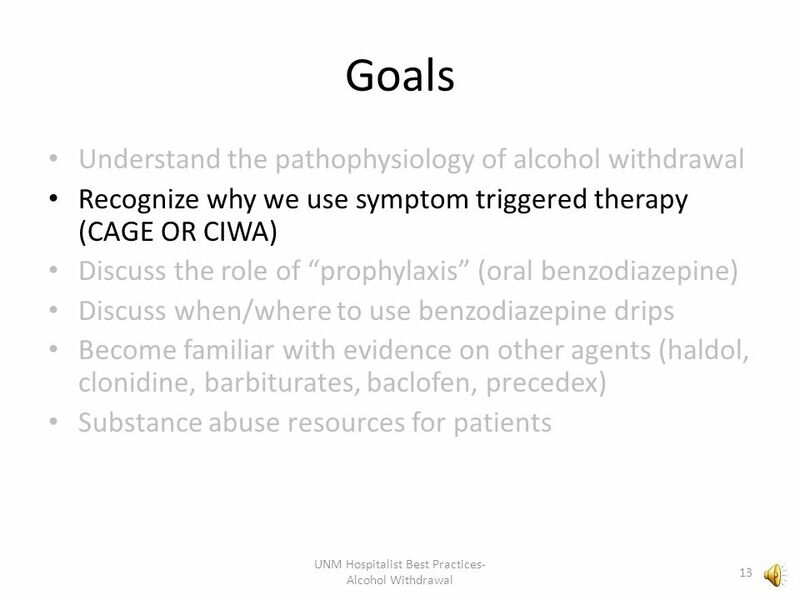 Saving Lives By Strengthening Our Region’s Trauma Care System December 5, 2013 MANAGEMENT OF THE INJURED PATIENT IN ALCOHOL WITHDRAWAL. 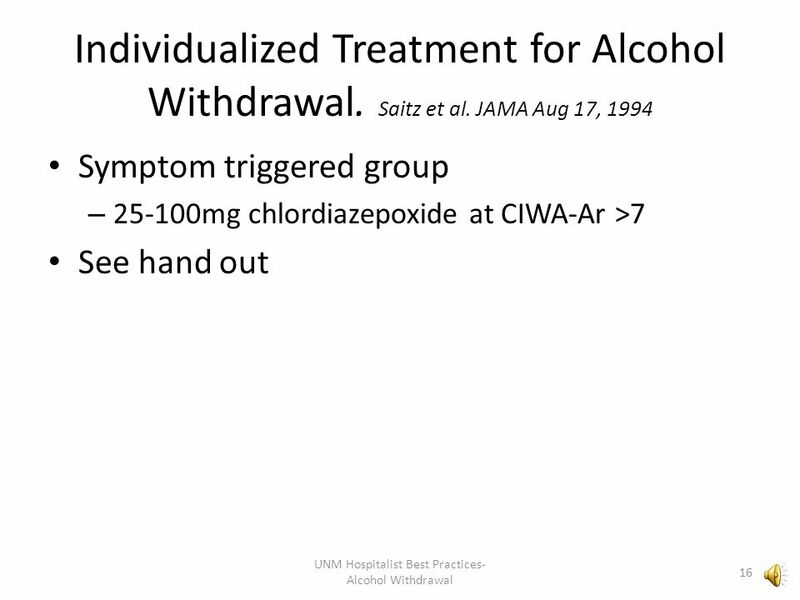 Appraisal of Alcohol Withdrawal in Native Americans with the Clinical Institute Withdrawal Assessment of Alcohol Revised Scale. 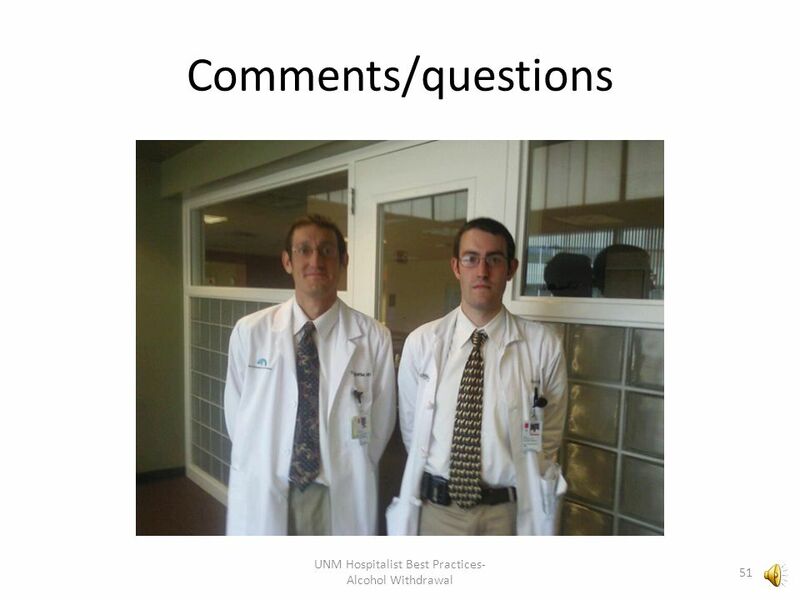 Paul Saladino MS, William. 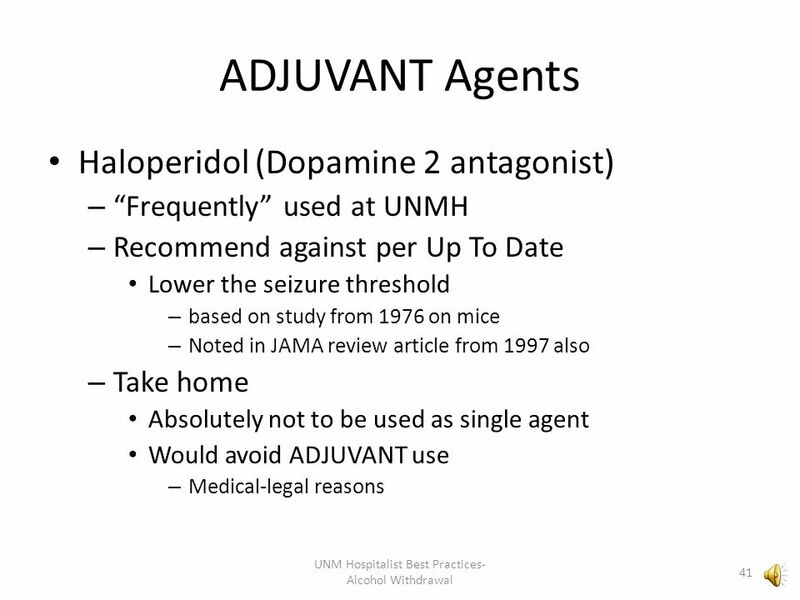 Copyright © 2013, 2010 by Saunders, an imprint of Elsevier Inc. Chapter 34 Sedative-Hypnotic Drugs. 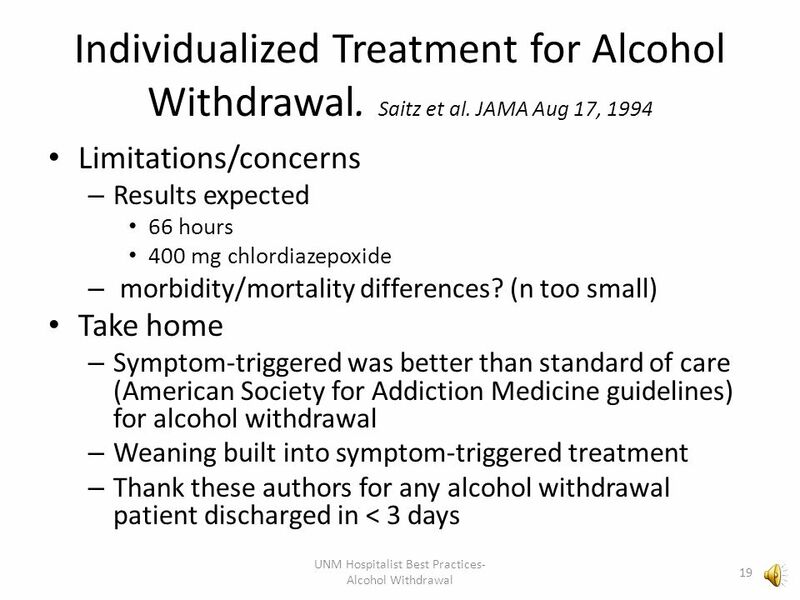 Toxin-Induced Seizures: Life-Threatening Forms of Withdrawl ACEP Scientific Assembly 2003, Boston, MA. 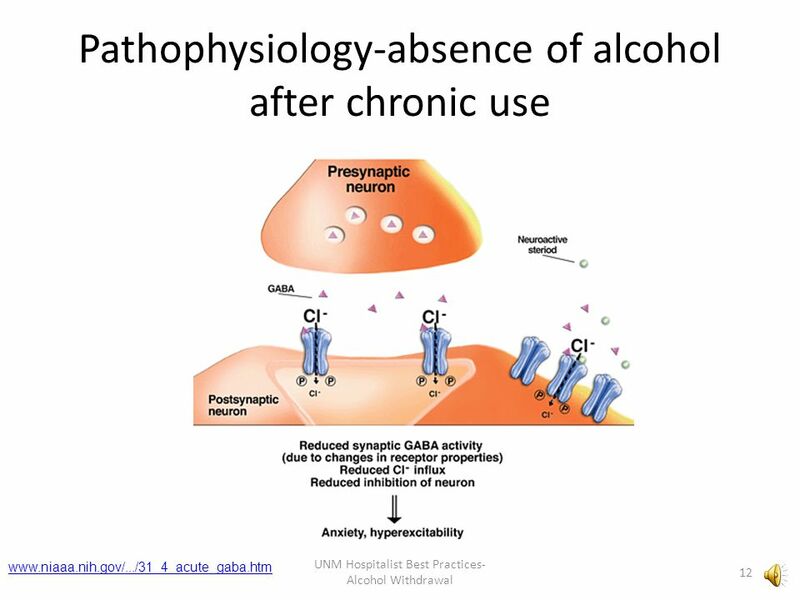 Neurological Emergencies Dr. Amal Alkhotani MBBCH, FRCPC, Epilepsy and EEG. 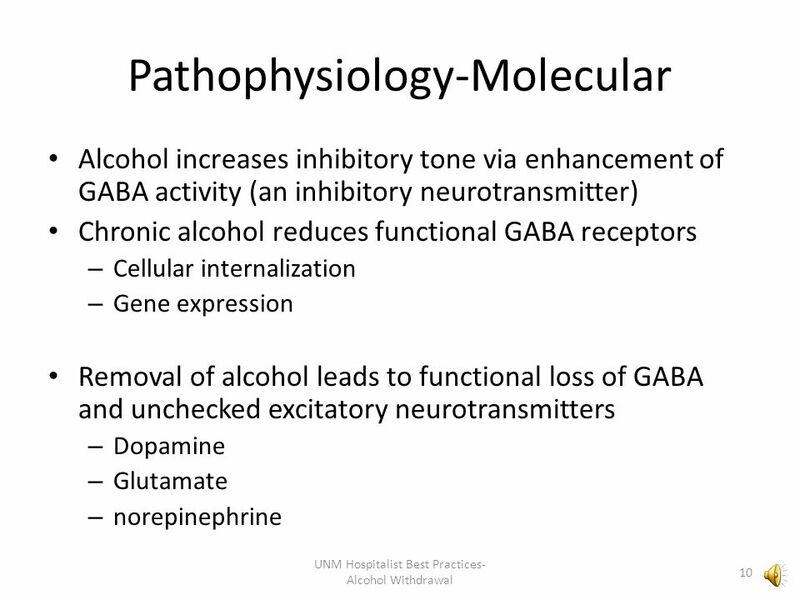 Developed for the Alcohol Medical Scholars Program 1 Alcohol and Cocaine Katie McQueen, M.D. 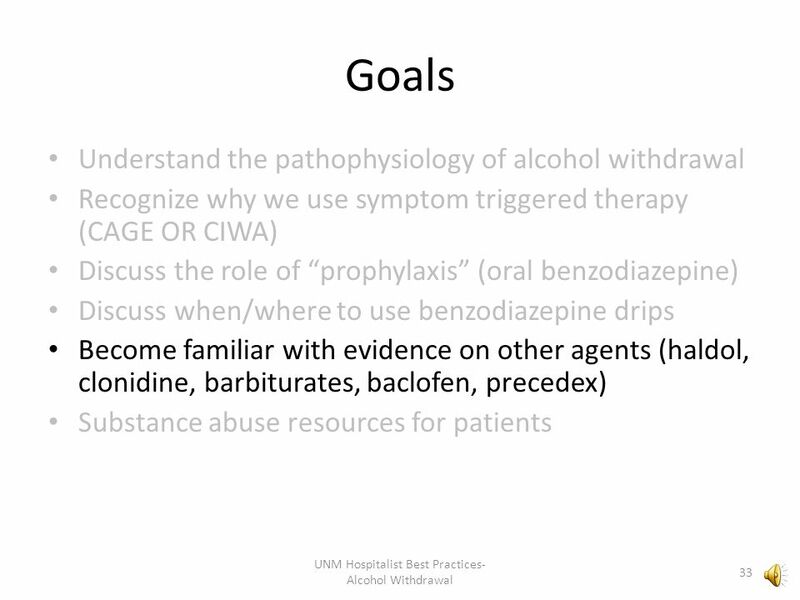 Baylor College of Medicine. 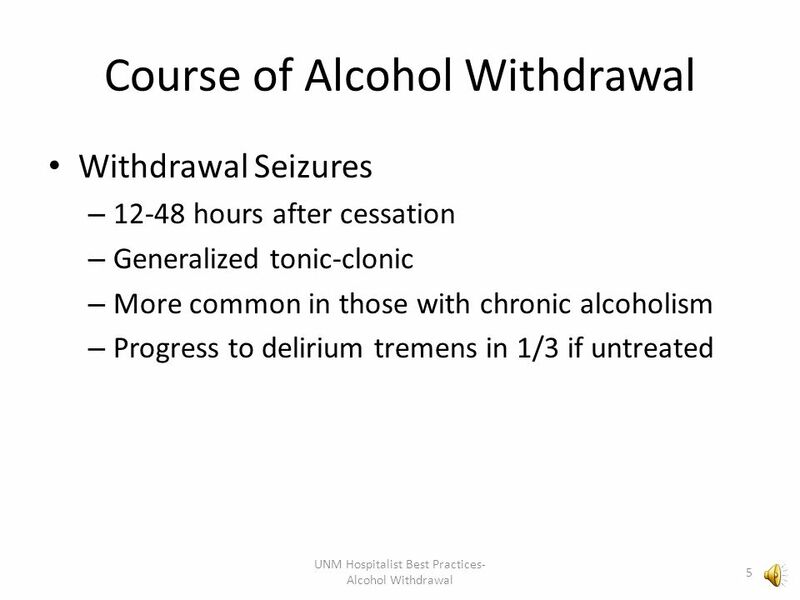 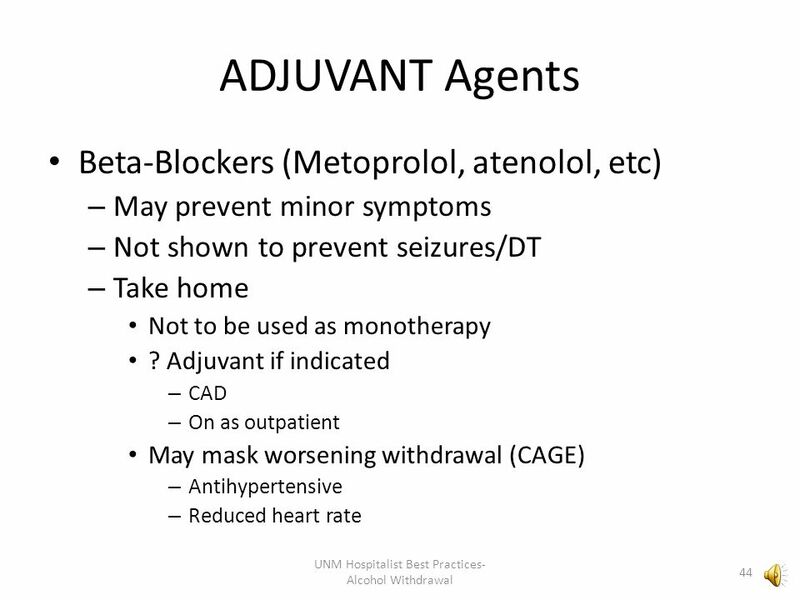 Status Epilepticus (SE): Rx Following Benzodiazepine Use Edward Sloan, MD, MPH Associate Professor Department of Emergency Medicine University of Illinois. 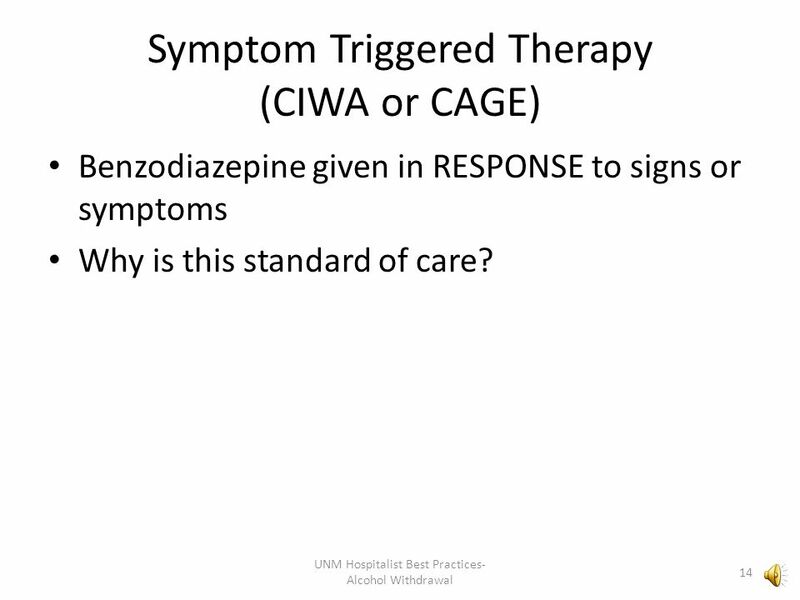 First Line Therapy in Acute Seizure Management William C. Dalsey, MD, FACEP, MBA Department of Emergency Medicine Robert Wood Johnson University Hospital. 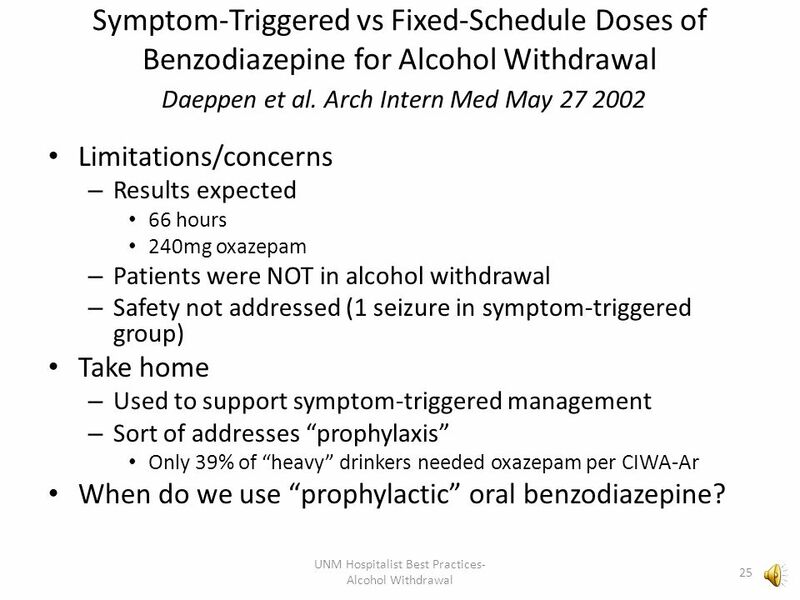 Emergency Psychiatry E. Prost. 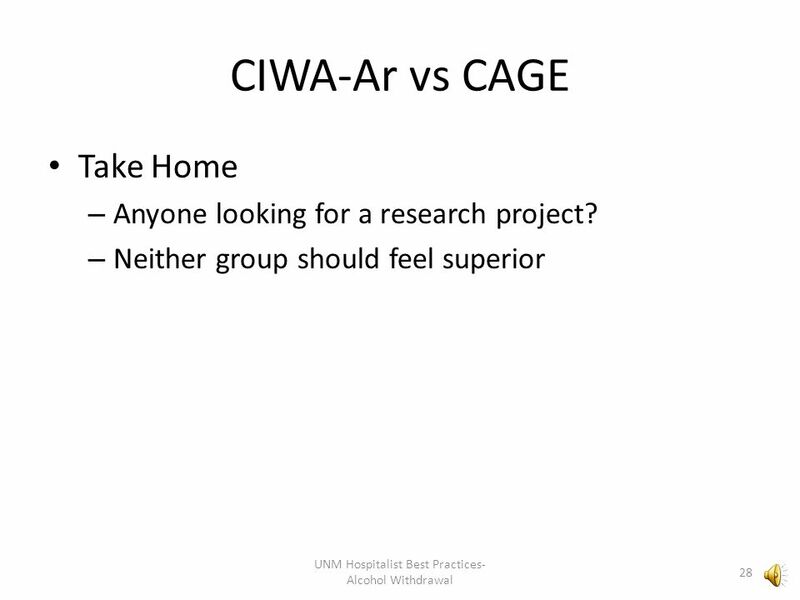 Outline 1. 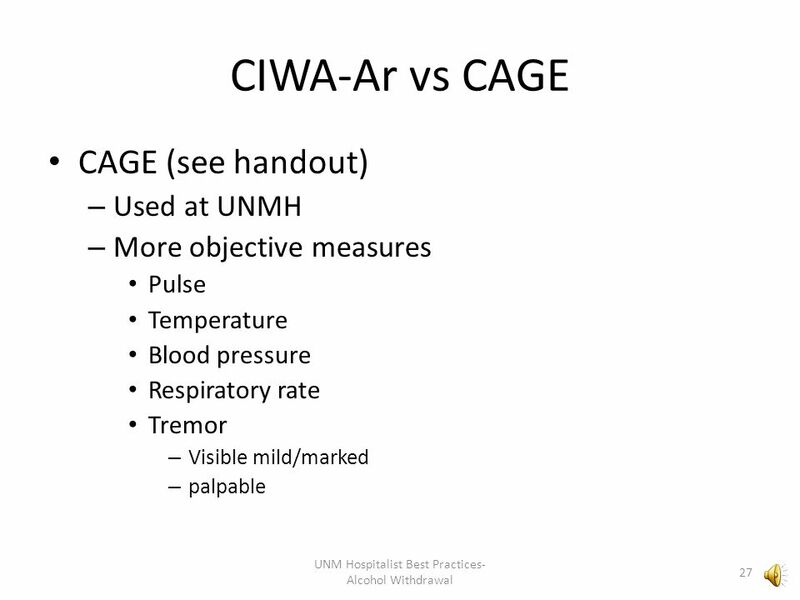 Emergency Room Assessment 2. 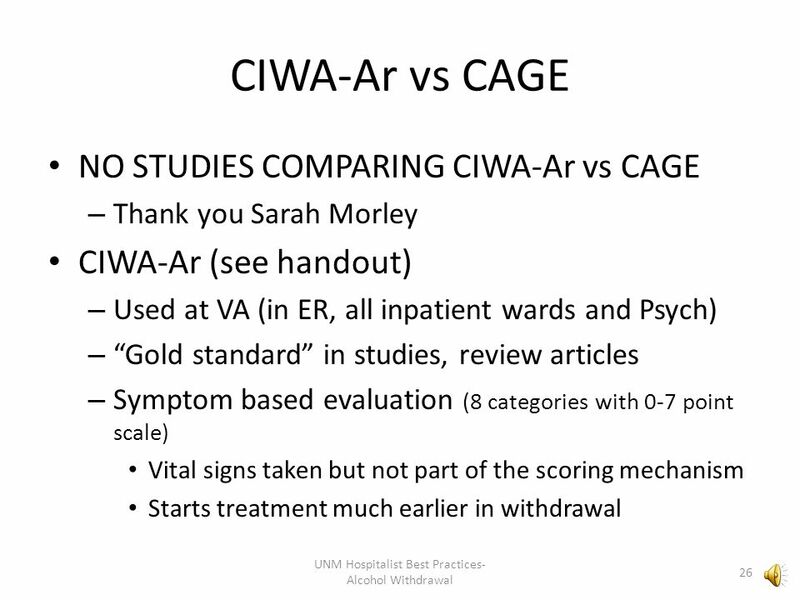 Behavioural Emergencies: Assessment 3. 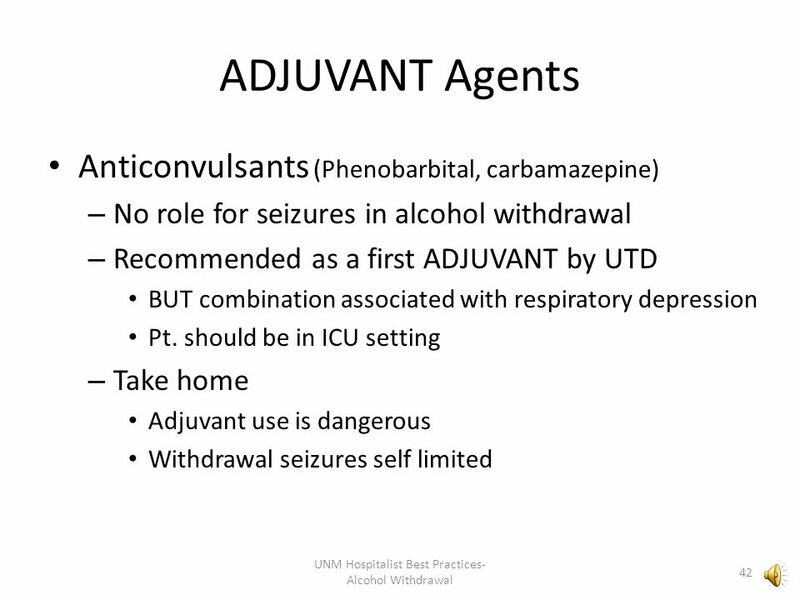 Behavioural Emergencies: Interventions. 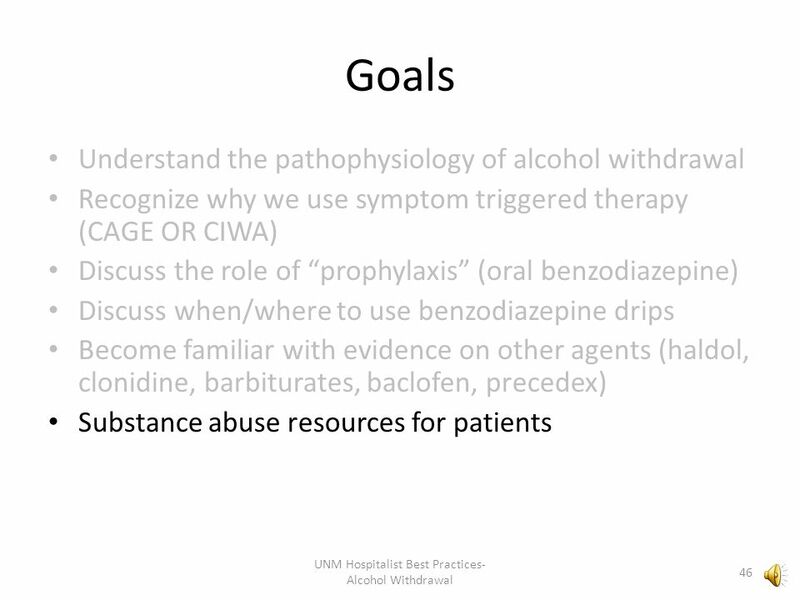 Treating opioid addiction in hospitalized medical patients Miriam Komaromy, MD, FACP Associate Director, ECHO Institute. 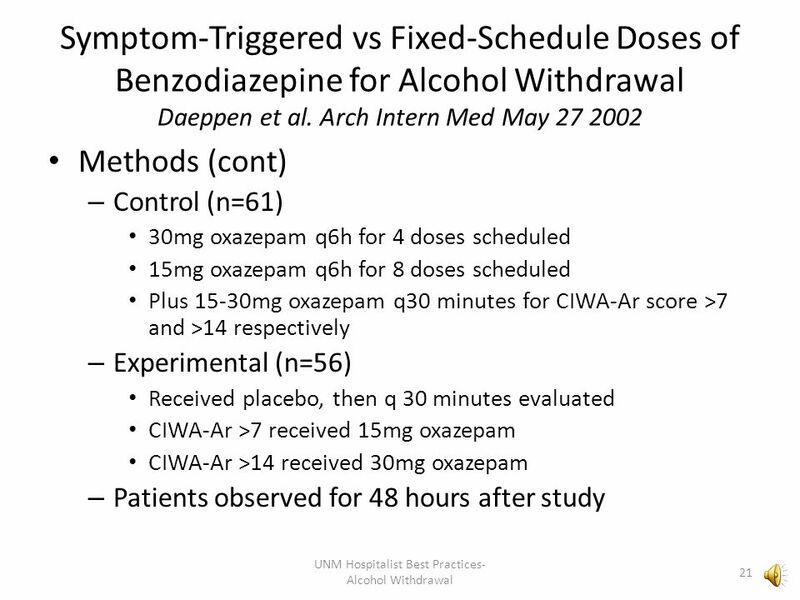 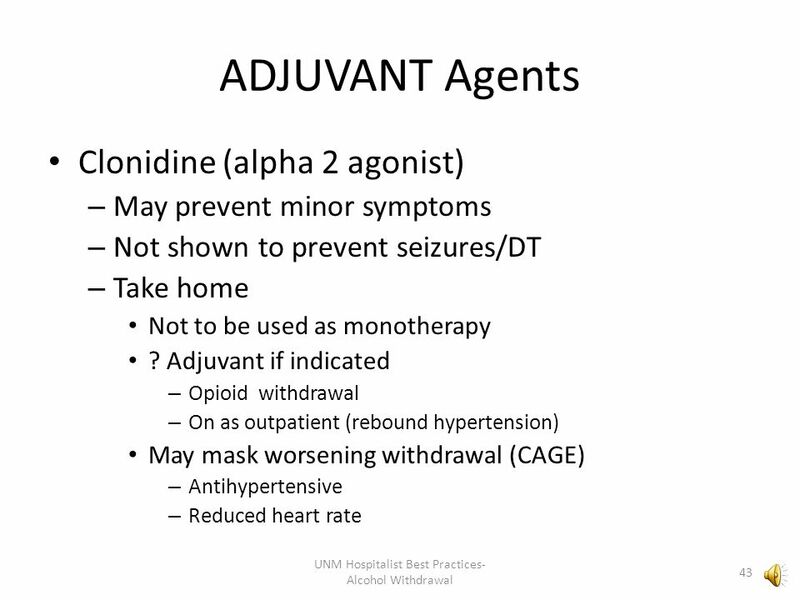 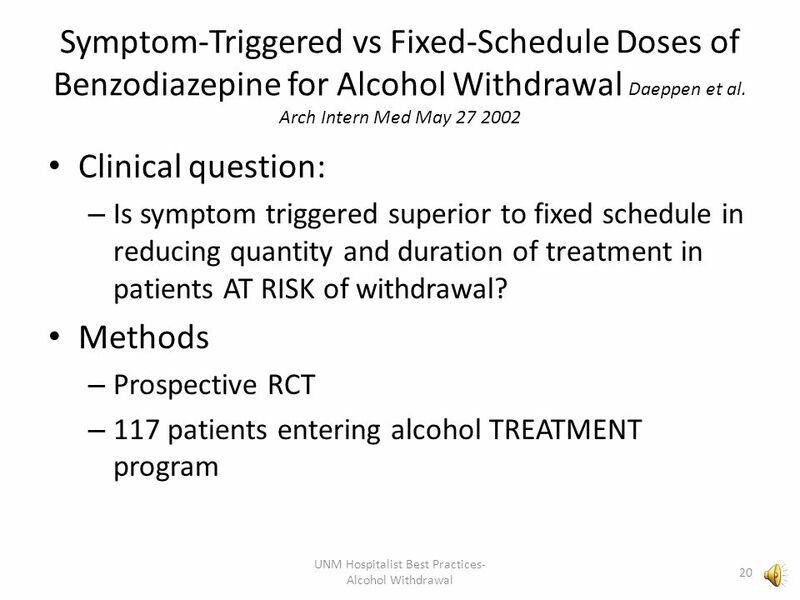 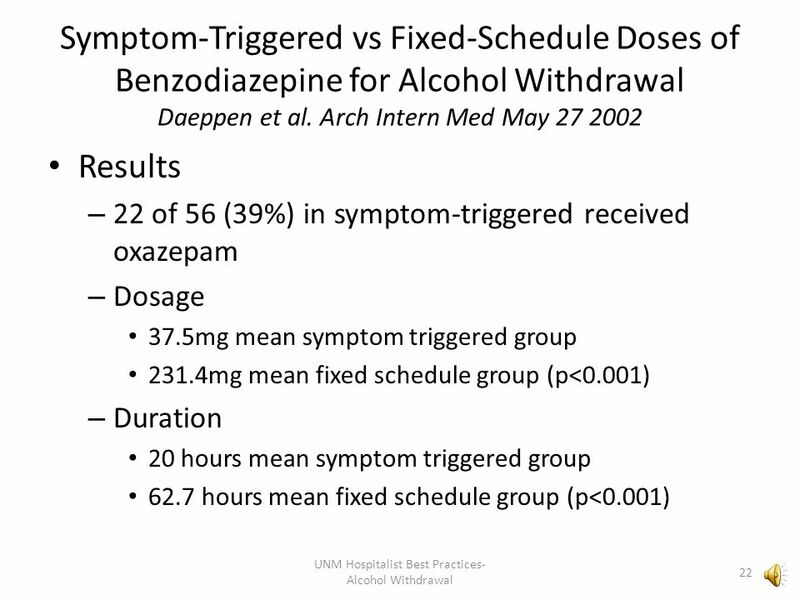 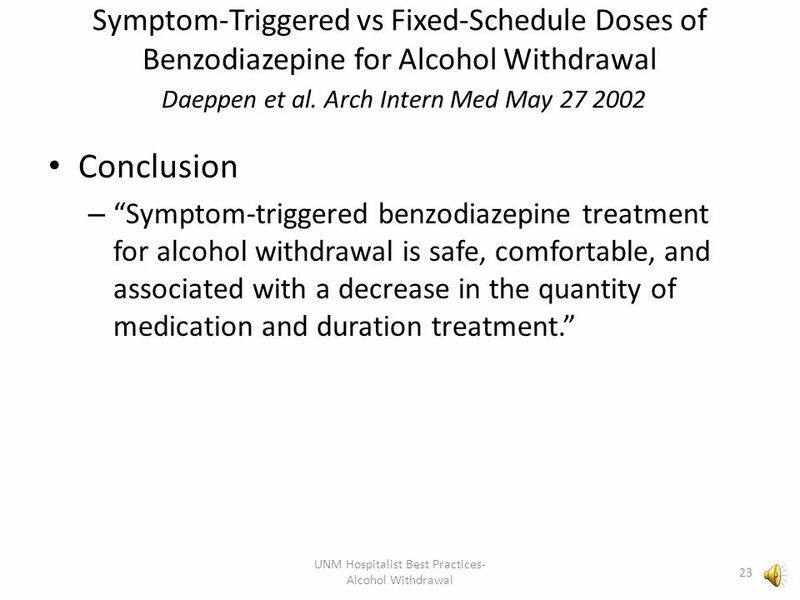 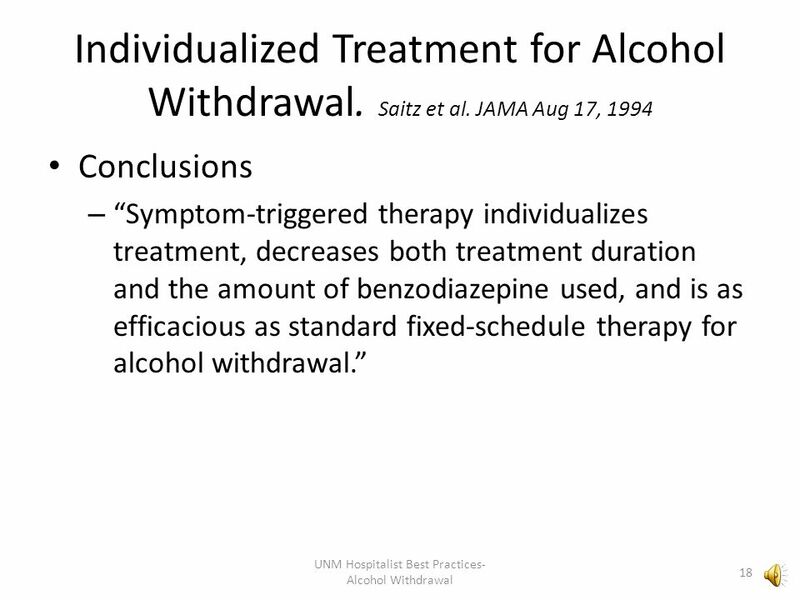 Symptom-triggered Vs Fixed Dosing Schedules in the Management of Alcohol Withdrawal Jay Murdoch Alcohol Nurse Specialist. 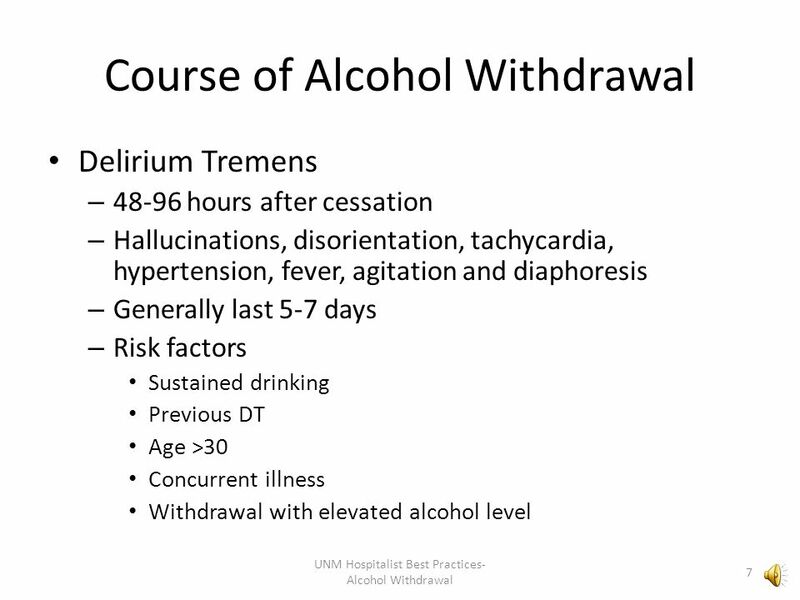 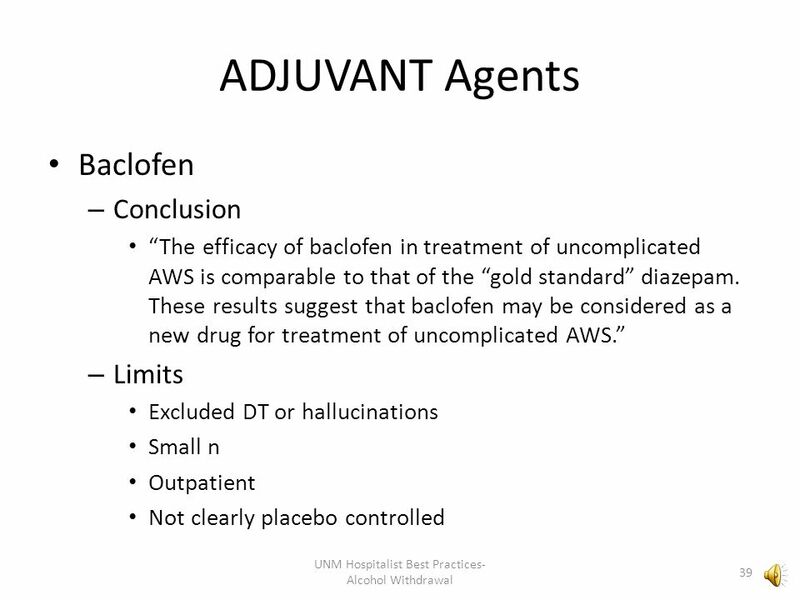 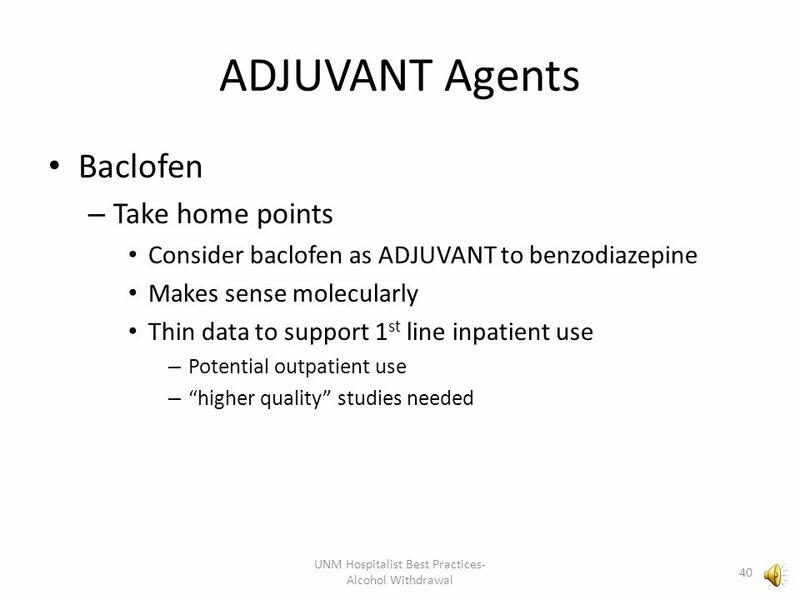 Delirium Tremens Jaymie McAllister EBP Presentation November 5, 2012. 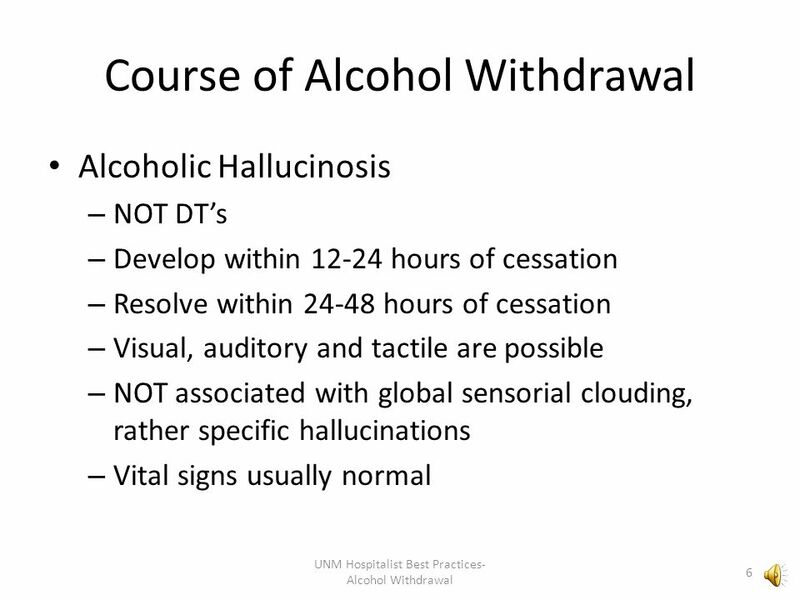 A LCOHOL USE DISORDER. 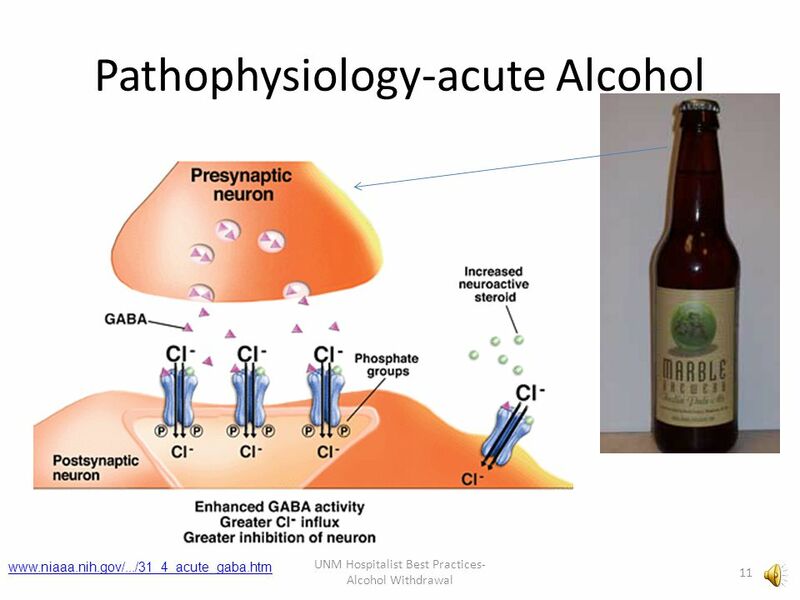 A LCOHOL USE IN I NDIA 21% of adult males use alcohol (Ray et al, 2004) 5% women use alcohol (Benegal et al, 2005) 50% of all drinkers.